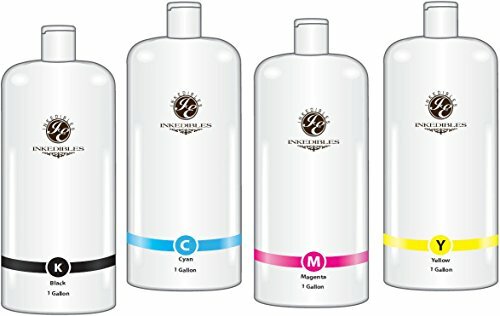 This item includes YummyInks TM premium edible ink refills in a generous, convenient size of 1 gallon. Draw ink from this convenient bottle up in a syringe, and inject the ink into our refillable cartridge ports found on YummyInks cartridges. Syringes sold separately and can be washed/reused. YummyInks inks are FDA compliant, and the best quality inks for your cake and edible ink requirements, producing beautiful prints for cake decorators and bakeries. Caution: DO NOT MIX regular inks with edible inks. YummyInks edible inks (food coloring) are intended to be used only in brand new compatible YummyInks refillable ink cartridges that are filled only with YummyInks edible ink. Never put edible ink inside a cartridge (or inside a printer) that has had regular ink running through it because contamination can occur. Be careful not to order a regular ink cartridge for use with edible printing! If you have any questions about this product by YummyInks TM, contact us by completing and submitting the form below. If you are looking for a specif part number, please include it with your message.